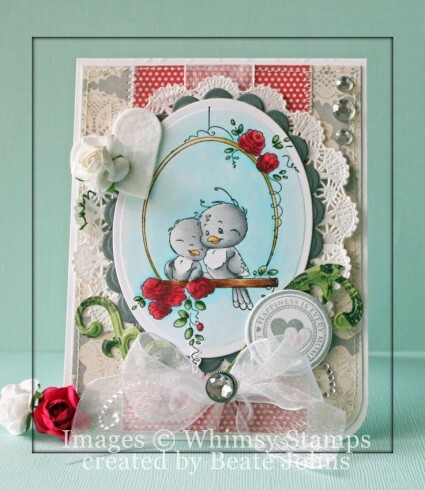 *NinaB Designs is a product designer for a few paper crafting companies including Spellbinders, Want2Scrap and Penny Black, and The Craft’s Meow. For this month’s hop, Nina challenged the team to create a project with the LOVE theme, which can be interpreted in many ways: Valentine, Anniversary and Friendship. I couldn’t help myself. For my card I used a new M-Bossabilities folder as well as Scalloped Border dies from the new Spellbinders Winter CHA release. I know, I am a lucky one to have them already. 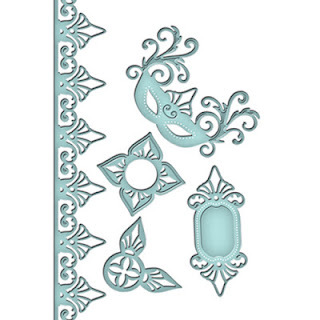 A little birdie told me that Nina designed those border dies. I started by scoring a 5 1/2″ x 8 1/2″ piece of Neenah Solar White cardstock at 3 1/2″ and 7″. 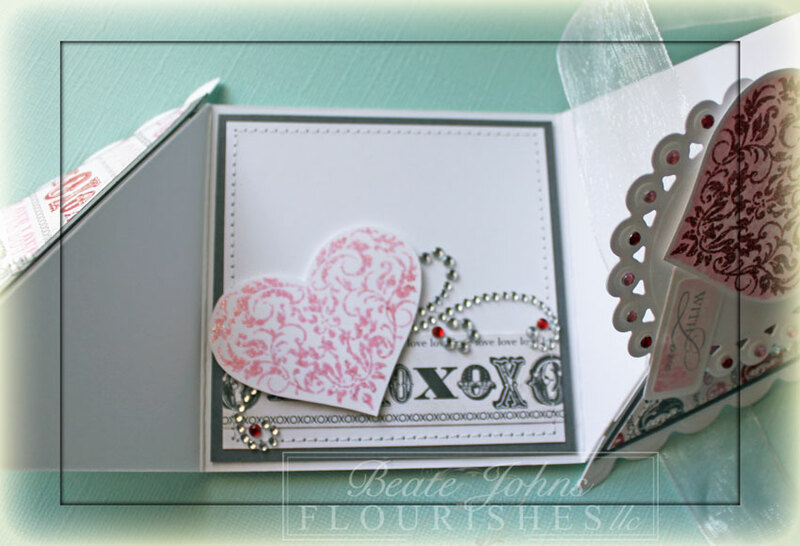 Next I used three dies from the A 2 Scalloped Border One Spellbinders™ Borderabilities® Card Creator dies to cut and emboss the 1 1/2″ edge of the tri-fold. The other outer panel was embossed with the new Spellbinders™Infinity M-Bossabilities™ folder. A sentiment from The Craft’s Meow Sent with Love was stamped in Tuxedo Black Memento Ink on a piece of Neenah Solar White cardstock that had been cut and embossed with the 3rd smallest of the Classic Oval SM Nestabilities® dies. 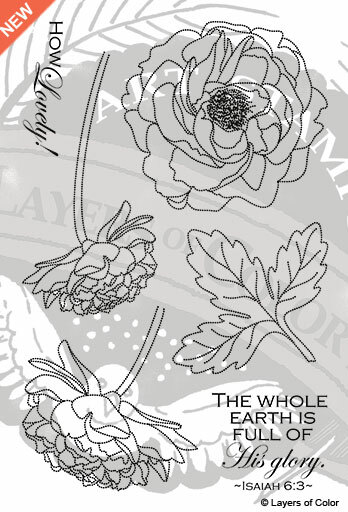 It was adhered to black cardstock cut and embossed with one of the Fancy Tags Three dies. A piece of a Beautiful Bloom Bling Border was adhered under the sentiment and flowers were threaded through one of the tag holes and adhered on the back. The sentiment panel was adhered slightly over the scallop border side to close the card. A piece of a Finesse Rhinestone swirl finish off the card. I picked the black and white (with a splash of pink) color scheme to make the card work for the current Simon Says Stamp Challenge. Today’s Timeless Tuesday Challenge hostess is Cindy Haffner. Her challenge to us is to create something with a butterfly. It can be a die cut, patterned paper with butterflies, embellishment or stamped image. 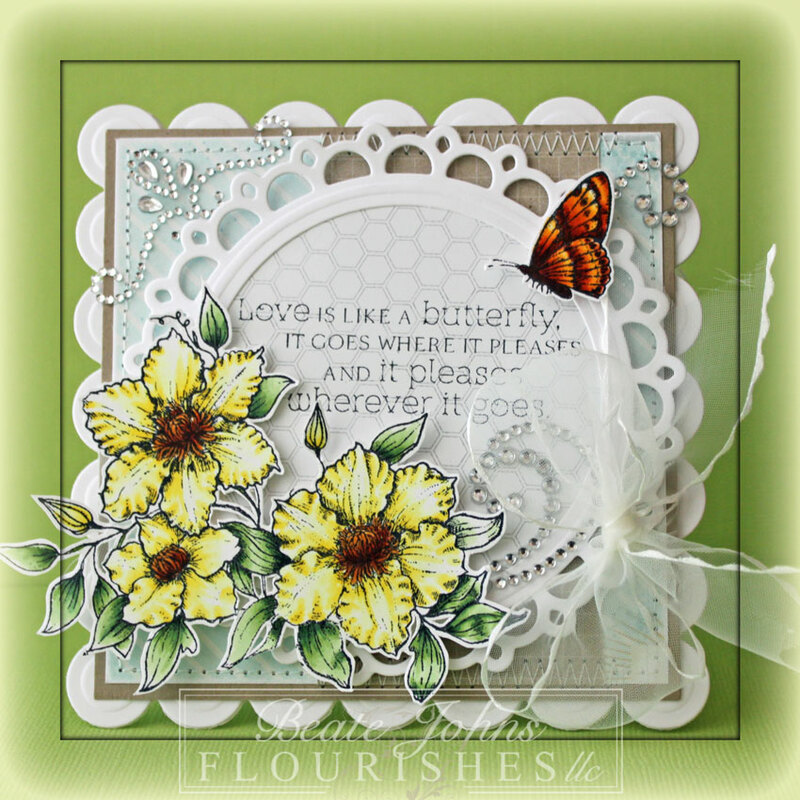 I pulled out Butterflies & Blossoms, one of my favorite Flourishes set along with some of my favorite Spellbinders die to create my sample. I started by cutting a frame with the second largest Floral Oval Nestabilities and a Classic Oval die out of white cardstock. A piece of Bo Bunny Country Garden paper was cut and embossed with a slightly larger Classic Oval die. 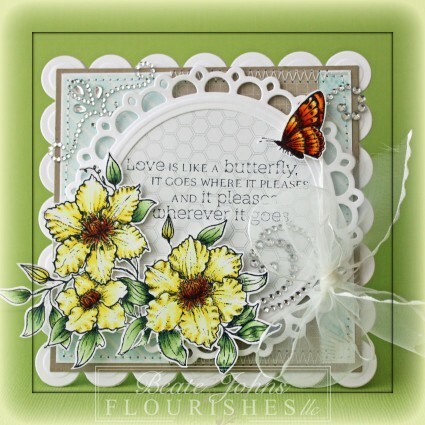 The edges were sanded and a sentiment from Butterflies & Blossoms was stamped in it’s center with Tuxedo Black Memento Ink. The oval was adhered behind the frame. The smaller floral and butterfly image were stamped in Tuxedo Black Ink on white paper, colored with Copic Markers (Flowers: Y00, Y11, Y13, Y15, YR23, YR27, E37 Leaves: YG00, YG01, YG03, G46 Butterfly: Y17, YR15, YR18), cut out and adhered on the lower left and upper right of the frame. Another piece of Country Garden paper was cut and embossed with a Grand Square Nestabilities die. The edges were sanded and stitched. A piece of Vellum cardstock was cut and embossed with a Lattice Motif die. Green May Arts Ribbon was threaded through the Vellum layer before it was adhered to the patterned paper square. 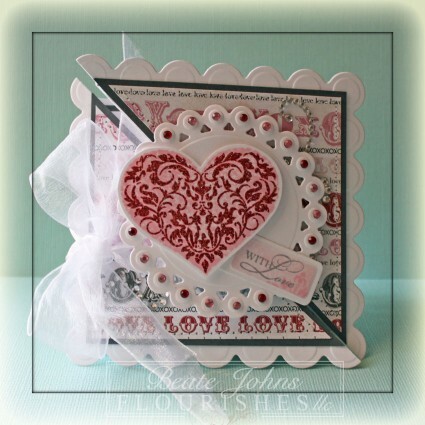 The ribbon was tied into a bow and topped with a button before the sentiment layers were adhered over the Vellum Lattice die cut. The layers were adhered to the card base, white cardstock cut and embossed with a Grand Scallop Square Nestabilities die. Parts of a rhinestone swirl on the top left and lower right finish off the card. It’s time for another Timeless Tuesday Challenge. 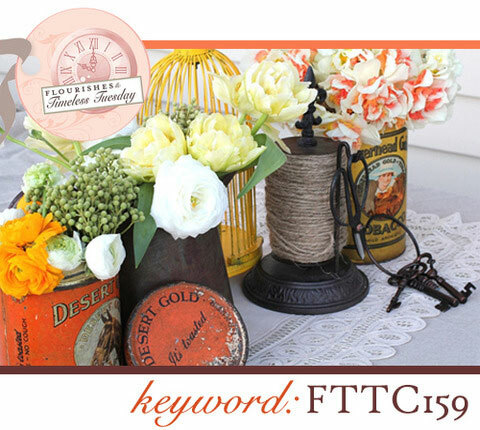 Heather is our hostess this week and she gave us a gorgeous inspiration photo to pick three colors from. I picked the light yellow, green and orange as my colors. 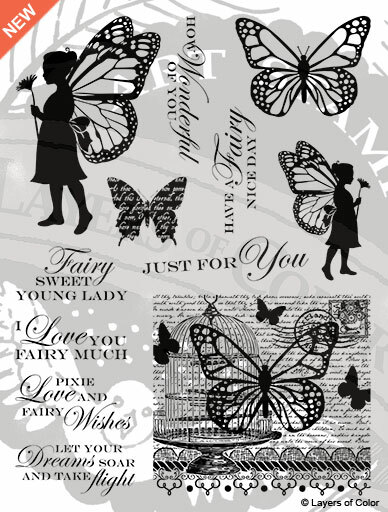 I stamped the big image from Butterflies & Blossoms in Tuxedo Black Memento Ink on Neenah Solar White cardstock. It was colored with Copic Markers (Flowers: Y00, Y11, Y13, YR23, YR27, E37 Leaves: G40, G43, G46) and cut out. The small butterfly was stamped and colored (Y17, YR15, YR18) as well. 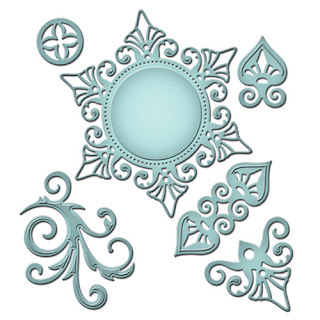 A frame was cut and embossed with a Picot Edge Circle and Standard Circle Nestabilities die. A piece of My Mind’s Eye Be Amazing patterned paper was cut with a slightly larger circle die and adhered behind the white frame. The cut out images were adhered over the frame with dimensionals. A 2″ x 3 7/8″ strip of Be Amazing Paper was adhered to a 3 7/8″ square of the same paper pack. The layers were stitched to a 1/4″ bigger Kraft cardstock square. May Arts Ribbon was tied around the square horizontally before the frame was adhered over the squares. The layers were adhered to the card base, white cardstock cut and embossed with a Grand Scallop Square Nestabilities die. Part of the new Fancy That Want2Scrap Border bling and parts of a Finesse Rhinestone Swirl finish off the card. 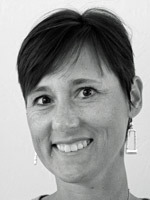 Today’s Timeless Tuesday challenge hostess is Mona Pendleton. Her challenge is to create a Trifold card. There are a lot of different tri-fold cards to choose one. I selected the Triangle Trifold. 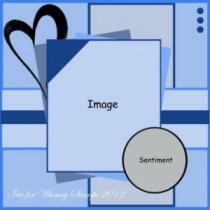 I created the base out of a 4″ x 12″ piece of white cardstock. A piece of Neenah Solar White cardstock was cut and embossed with the largest Beaded Square Nestabilities die and cut diagonally. A 3 3/4″ square of Basic Grey cardstock and a 3 1/2″ piece of Echo Park Yours Truly patterned paper were cut in half as well and stitched together. The layers were first adhered over the scalloped triangles, then over the card base fronts. 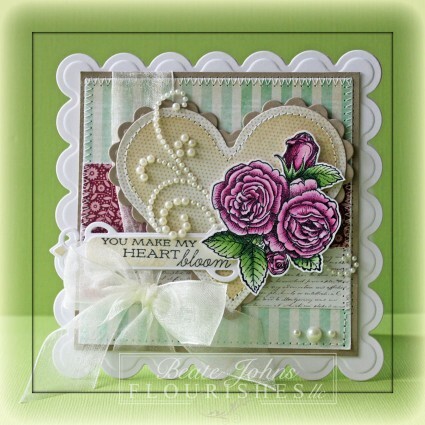 The sold heart from Fanciful Flourishes was stamped in Spun Sugar Distress ink on Neenah Solar White cardstock and cut out. The flourished heart was stamped over the solid one in Fired Brick Distress ink and embossed with Iridescent Ice Embossing Powder (Stampin’ Up!). The heart was adhered to another piece of white cardstock, cut and embossed with the second largest Beaded Circle Nestabilities die. Pink and Red Baby Bling were adhered to the beaded parts of the circle. White Organdy ribbon was tied around the card base to keep it shut. The image layers were adhered above one part of the card front with dimensionals after parts of a Finesse Rhinestone Swirl was adhered to the upper right and lower left of the card. A sentiment from Fanciful Flourishes was stamped in London Fog Memento Ink on a piece of cardstock, cut and embossed with a retired tag die. The inside part of the tag was sponged with Spun Sugar before the tag was adhered slightly under the heart. 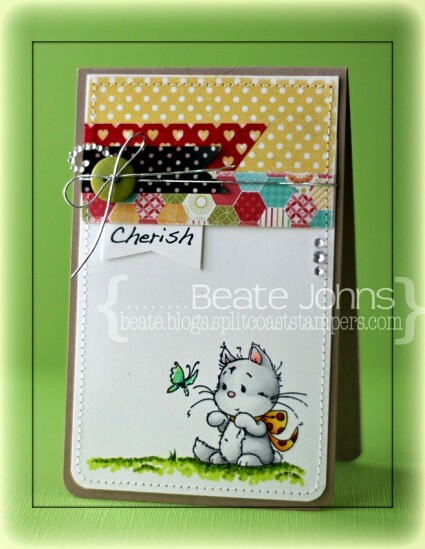 The inside panel of the card base was decorated to match the outside. I hope you have time participate in the challenge. Like I said, there are lots of different trifold cards out there and they are all not hard. Thanks so much for stopping by!